Once again as Remembrance Day, November 11, approaches we see the phenomenon of ‘poppy creep’. This is the growing trend of all the good and great to wear a poppy as early and as ostentatiously as possible. Before even the last trick-or-treater has disappeared, the talking heads of media and politics will have donned their yearly poppy regalia. It has become something of a race in our culture to see who can show the greatest respect by being among the first to be adorned with the red flower. One hopes that it is not just because we all find it much easier to make the annual token show of respect then to actually think about or, even more unlikely, do anything for the military veterans of Canada’s wars. Poppies themselves have symbolized death in war since at least the Napoleonic wars, but it was John McCrae’s poem “In Flanders Fields” that helped to popularize that meaning of that flower internationally. The field poppy itself is an annual plant which flowers each year between about May and August. Its seeds are disseminated on the wind and can lie dormant in the ground for a long time. The spring of 1915 was the first time that warm weather had begun to warm up the countryside after the cold winter at war in 1914-1915. In the region around Ypres in Belgian Flanders the months of April and May 1915 were unusually warm. The once-rich soil in the fields along the Western Front had become infused with lime from the enormous artillery bombardments, leaving it barren where nothing would grow.Except for the poppies. This is what happened in parts of the front lines in Belgium and France. Once the ground was disturbed by the fighting, the poppy seeds lying in the ground began to germinate and grow. The bright red flowers, as delicate as they are, grew by the millions, thriving amid the destruction and often overgrew on the mass graves of soldiers. In April of 2015, Guelph, Ontario’s John McCrae — a doctor and professor of medicine at McGill University who quickly enlisted with outbreak of war — had spent 17 gruelling days caring for the wounded and performing surgery on Canadian and Allied troops at the Second Battle of Ypres in western Belgium. Exhausted and distraught by the loss of a close friend, seeing the sea of red poppies that had sprung up in the disturbed ground of the burials around the artillery position he was in, he jotted down a poem on a scrap of paper. The familiar lines of McCrae’s poem have become some of the most famous words written in relation to the First World War. While that poem has become famous his was not the only attempt to use poetry to find reason in the madness of war. 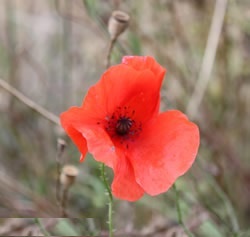 British poet, Isaac Rosenberg wrote the poem called “Break of Day in the Trenches” that implicitly contrasts the appearance of the poppy with its black center and floppy burst of red leaves to a gunshot wound frozen in time. To stick behind my ear. To cross the sleeping green between. The torn fields of France. Just a little white with the dust. The dark but realistic view of war embodied by that poem and that poppy behind the writer’s ear is, by the grace of God, not familiar to most of us who stuff a few dollars into the tray at Tim Hortons and wear our plastic flowers to show our membership in the community of those who “care”. So when you see a poppy on November 11th remember that it isn’t about the person wearing it or about you, it is about death and dying and a horror that you are spared from because of the men and women who stood on guard for thee. School children in Canada are reminded every year of John McCrae's poem " In Flanders Fields" and the poppies that are worn for remembrance day. The poppies, and to a lesser extent the poem, are common on November the 11th all over the Commonwealth. Those symbols and even the date, are not as commonly commemorated in the United States. This is unlikely because the wearing of the poppy and it's connection to "In Flanders Fields" are an American invention. After the war was over, Michael returned to the University of Georgia and taught a class of disabled servicemen. Realizing the need to provide financial and occupational support for these servicemen, she pursued the idea of selling silk poppies as a means of raising funds to assist disabled veterans. In 1921, her efforts resulted in the poppy being adopted as a symbol of remembrance for war veterans by the American Legion Auxillery, and by Earl Haig's British Legion Appeal Fund later that year. Moina Michael's response to " In Flanders Fields" is in stark contrast to the ideals which inform our own, more enlightened, age. It is widely understood now that the correct attitude to the current generation of veterans is to wear a poppy for a week or so around the beginning of November and take a minute or two of silence on the eleventh. This is the most that can, or should, be expected of the general public. The government is in charge of caring for veterans, although to be fair it is not considered to be a particularly important issue during elections. As long as the whole subject is kept out of mind for the rest of the year, the government is seen to be doing it's duty and as for the rest of us, we wear a poppy in November. Not content with "keeping faith" Moina Michaels was moved to write a poem in response to Capt. McCrae's ode. 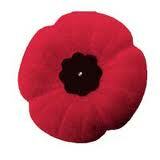 November 11 is the date we traditionally remember our veterans. The Red Poppies that are so commonly worn have come to mean less about the war that spawned them, or the wars that followed, or the political leanings of those who wear them, but rather they have become a show of respect for veterans. The truth is that things don’t change much for soldiers or veterans, including the way we think about them, or don’t think about them at all, when it isn’t November 11th. Siegfried Loraine Sassoon, born September 8, 1886 died September 1, 1967 was one of the leading poets of the First World War. His poetry described the horrors of the trenches, and attacked the patriotic pretensions of those he held responsible for the war. McCrae served in the artillery during the Second Boer War. When the United Kingdom declared war on Germany at the start of World War I, Canada, as a Dominion within the British Empire, was at war as well. McCrae was appointed as a field surgeon in the Canadian artillery and was in charge of a field hospital during the Second Battle of Ypres in 1915. McCrae's friend and former student, Lt. Alexis Helmer, was killed in the battle. Lieutenant Alexis Helmer was an officer in the 2nd Battery, 1st Brigade Canadian Field Artillery. On the morning of Sunday 2nd May Lieutenant Helmer left his dugout and was killed instantly by a direct hit from an 8 inch German shell. What body parts could be found were later gathered into sandbags and laid in an army blanket for burial that evening. Lieutenant Helmer was buried on the 2nd May. 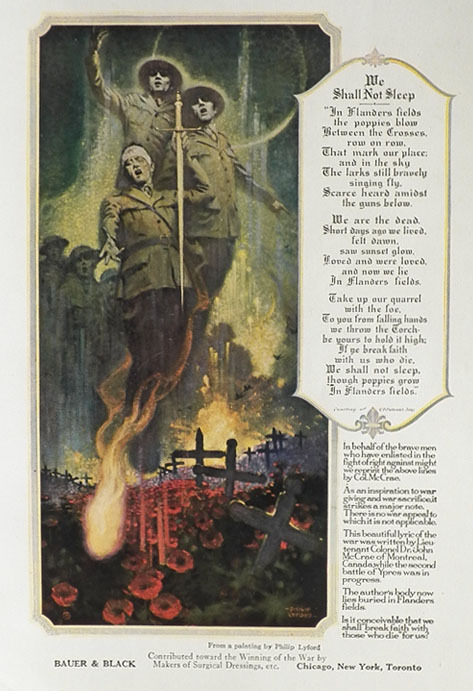 In the absence of the chaplain, Major John McCrae conducted a simple service at the graveside, reciting from memory some passages from the Church of England's 'Order of Burial of the Dead'. A wooden cross marked the burial place. The day after the funeral for Lt. Helmer Major McCrae was seen writing the poem while sitting on the rear step of an ambulance the next day while looking at Helmer's grave and the vivid red poppies that were springing up in the burial ground. Some say that McCrae was so upset after Helmer's burial that he wrote the poem in twenty minutes in an attempt to compose himself. John McCrae suffered from severe asthma all his life, In January, 1918, while commanding No. 3 Canadian General Hospital(McGill) at Boulogne, McCrae contracted pneumonia. He died six days later. His flag-draped coffin was borne on a gun carriage and the mourners – who included Sir Arthur Currie and many of McCrae's friends and staff – were preceded by McCrae's charger, "Bonfire", with McCrae's boots reversed in the stirrups. Every generation has had their own interpretation of the last verse of the poem. Are we fighting for Peace, or just to defeat the Hun? Who is the foe? What do we owe the fallen? Do we keep faith by simply asking the questions, or is more required of us? November 11 is the date we traditionally remember our veterans. The Red Poppies so commonly worn have come to mean less about the war that spawned them, or the wars that followed or the political leanings of those who wear them but rather they are a show of respect for veterans. When we take a little time to remember the men and women of our Armed Forces, we can spend some of that time remembering how we think about them when it isn’t November 11th. The poem “Tommy” by Rudyard Kipling was first printed in the Scots Observer in the first half of 1890, and later published in “Barrack-Room Ballads and Other Verses” in 1892. While Kipling remains controversial in some circles for his defence of the British Empire much of his work is still surprisingly relevant. With its language only a little updated his poem “Tommy” could easily apply to Canadian soldiers today. The publican 'e up an' sez, "We serve no red-coats here." O it's "Thank you, Mister Atkins", when the band begins to play. But when it comes to fightin', Lord! they'll shove me in the stalls! O it's "Special train for Atkins" when the trooper's on the tide. Then it's Tommy this, an' Tommy that, an' "Tommy, 'ow's yer soul?" We'll wait for extry rations if you treat us rational. The Widow's Uniform is not the soldier-man's disgrace. For it's Tommy this, an' Tommy that, an' "Chuck him out, the brute!" An' Tommy ain't a bloomin' fool -- you bet that Tommy sees! It is important to remember that things don’t change much for soldiers or veterans, including the way we think about them, or don’t think about them at all, when it isn’t November 11th.